Mumbai City FC succumbed to the first loss of their ISL 2016 campaign after a Michael Chopra goal gave Kerala Blasters FC a vital 1-0 victory at home at the Jawaharlal Nehru Stadium in Kochi. “We hoped for a victory when we named the lineup but maybe in the last 20 minutes we were playing for a draw. We came to win the game but we didn't have accuracy in our passing. Sometimes, it happens. That hurt us and we were not playing for a draw. We have to analyse and improve,” said Mumbai City FC coach Alexandre Guimaraes. Missing left back Sena Ralte, defensive midfielder Pronay Halder and marquee player Diego Forlan, Mumbai needed to start of the blocks strong but Kerala Blasters FC were too good and controlled the game from the get-go. “We made several adjustments at half-time and I think we were better in the second half. We were even better in the last 20 to 25 minutes. We also had our chances but we need to move on. We need to evaluate who is fit in our team and make our plans for Delhi. But we have what we have. Diego (Forlan) is injured, Boithang (Haokip) felt something in his leg but we have to manage,” said the Brazilian born Costa Rican manager. “We tried to rotate some players, especially in the defensive department because we need them fresh. Ralte has been doing very well. But if we push him to play in all games, maybe it can be damaging to him. We decided to rest him in order for him to feature against Delhi," he added. The first half was a disaster for Mumbai, as according to Guimaraes, the players could not get their touch right and the lack of composure meant that possession was squandered many times. The only bright spot in a worrisome Mumbai City FC performance was the cameo appearance by Haitian Sony Norde. The midfielder fashioned a clear chance for himself, and had it not been for a goal-line clearance by Aaron Hughes, it could well have been a point salvaged for Mumbai. But as off now, the grueling schedule of the ISL means that Guimaraes is forced to use his star midfielder in a cautious manner. “We had to be careful with Sony. He has travelled a lot recently. He played 20 minutes in the previous game and again had to fly to come here. We wanted to be careful with him. He is a very important player for us and he showed it today. But we have to be careful with him,” he said. 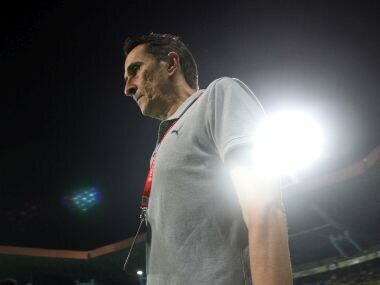 It has become routine for Guimaraes to worry about his forward line and their tie against Kerala Blasters FC was no different. “The Kerala defense did not have an easy day. Our forwards troubled them in the second half. But it is a problem we have. We lost Gaston (Sangoy) before the season and now we Diego is sidelined with a small injury. So we have to manage. We are waiting as to what happens with Sunil (Chhetri) with Bengaluru FC. But yes, we need a number nine,” said Guimaraes. Speaking of Diego Forlan, Guimaraes confirmed that he will miss the game against Delhi Dynamos but might be available for their home game against FC Goa.